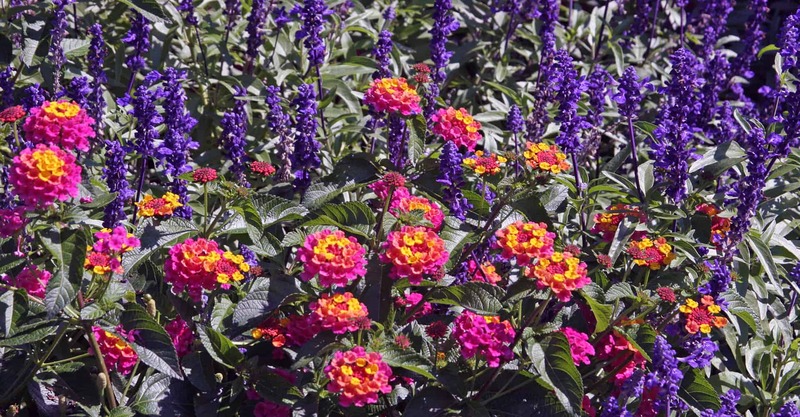 The garden offers an ongoing source of bunches of flowers that will bring color and cheer into the house. Gardens will also supply small gifts to give to a friend or neighbor. Creating small bouquets of flowers and attractive foliage is fun, and it is the perfect way to celebrate May Day! From fungus to photosynthesis, you’ll be captivated as you study how nature works. You don’t have to sit still to meditate…meditation is letting your thoughts and concerns slip away as you focus on just one thing, and that singular point of concentration can be planting or pulling weeds. Let go of your concerns and center your full attention on the garden. It is widely recognized that the longer it takes to move produce from the farm to the consumer, the more nutrients are lost. But the fruits and vegetables that you grow will travel from garden to table in mere minutes. Your own backyard can supply the most flavorful and nutritious food that money can’t buy! Studies have shown that gardening provides a weight-bearing workout that is equivalent to a stint at the gym. The bending, lifting, and moving that you do in the garden results in a beautiful garden and a healthier you. It makes sense that so many couples want to get married in a garden…a place of natural beauty is the ideal location for a party. Weddings, birthdays, graduations, births and family reunions belong in the garden. Everyone appreciates a room with a view, and when every window of your home looks out over a lovely landscape you are always blessed. Gardens will make you smile as you pull into your driveway, wash dishes at the kitchen sink, and look out the living room windows. We all remember how pleasurable it was to have a new box of crayons and to paint with watercolors when we were children. Using color with abandon is fun. As adults we can experience this again when we plant annuals in the garden. One year it might be flowers in pale pinks and peach tones…the next season in a brilliant orange and purple. Aromatherapy? It all started in the garden. The best air freshener comes from fragrant flowers that are planted near your decks, patios and bedroom windows. The garden is the perfect place to for a soothing chat. Make sure that you provide comfortable seating, and a pot of tea never hurts either…sit with family or friends in surroundings conducive to a satisfying tête-à-tête. We value the natural world and know that what we do in our yards and gardens can help keep our surroundings in balance. Natural predators keep animals and insects from becoming pests in the garden and maintain the equilibrium of our environment. An artist friend once said that “All I know is that if you put enough beauty in, something has to come out.” In this way our landscapes kindle our artistic juices…because they are beautiful, gardens delight and inspire us in all aspects of our lives. I have never understood those who want to put wind chimes in the garden. For me, one of the gifts that gardening brings is the music of the birds accompanied by the rustling of the breeze in surrounding trees. I once read about a survey that asked people why they liked working in their yard and garden. The majority replied that they felt closest to God when they were gardening. Perhaps we are better able to experience God’s presence in when we are engaged in a life-affirming activity such as tending a garden. Eat a cherry tomato fresh off the vine, plant giant sunflowers, or make a leaf-lined stick house for the fairies…the garden is filled with fun for kids and adults. Provide the children in your life the gift of gardening, and you will receive as you give. The wonderful thing about a garden is that it is constantly changing. We can never be bored when our surroundings transform from minute to minute and day to day. Maintaining a beautiful landscape makes sense economically…no matter where you live, a beautiful landscape adds to your home’s worth. There’s no doubt about it, it’s a taxing world. Working in the garden can relieve tension and worry, and we can all use more of that in our lives. All over the earth and through the ages people have tended gardens. It is nice to know that we share this activity with all cultures throughout history. Gardening brings people together in generous ways. From the garden clubs that are involved in civic beautification programs and the volunteer Master Gardeners who assist the gardening public to the neighbor who shares pieces of perennials, gardeners ten to be open hearted and charitable. Perhaps these sorts of people are attracted to gardening, but I think that there is something about gardening that cultivates generosity. Many plants catch rays of sunlight in the early morning and late afternoon, illuminating areas of the garden in a way that is guaranteed to lift your spirits. 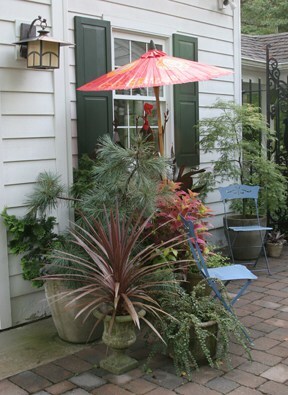 Place grasses or plants that have golden foliage where they will capture the rays of the sun. It doesn’t take many plants to make an herb garden, and there is nothing like fresh herbs to improve dinner. New chives on potatoes in spring, fresh basil on tomatoes tastes during the summer and fresh rosemary on roasted autumnal vegetables makes a meal seasonable and special. The therapeutic benefits of gardening have been well documented, so hospitals, nursing homes and rehabilitation centers frequently plant gardens for their patients and their families. Your home garden can be just as curative! Remember that old call to action, “Act Locally, Think Globally”? It’s certainly good advice for the garden. If you are concerned about having a healthy planet, your landscape is the place to start. Grow organically, conserve water and plant trees. You may not be able to change the world, but you can control what happens in your own backyard. Gardening is contagious. If you spend time sprucing up your landscape, your neighbors may follow suit. Start something positive…the beauty you sow on your own property might spread to the entire neighborhood. In the garden there is always something new to learn. Being involved with plants and gardening keeps your mind working and is always interesting. There are times in the garden that you just have to laugh. Whether you chuckle at a mistake you’ve made, a delightfully whimsical flower or the antics of the squirrels, being in the garden is sure to kindle your funny bone. Gardening is not instant coffee. We usually have to wait for perennials to mature, for a tree to flower and for fruit to form. Sometimes it takes longer then expected, and other times the plants never achieve the desired results. We are in partnership with Mother Nature in the garden, and she is the majority stockholder. Much of life is beyond our control and the garden is a great place to perfect serenity and fortitude. The garden brings constant movement. Grasses sway in the wind, birds and butterflies flit in and out, and plants grow and change from spring to fall. From minute to minute things change in the landscape, and we get to watch the show. Our gardens are filled with delightful surprises. Yes, sometimes plants die or don’t grow as we’d like, but other times we are astonished at their beauty. A self-seeded perennial, sparkling frost coating the edge of scarlet leaves, or a group of beautiful flowers can charm us when we least expect it. There is nothing like a garden to remind us that everything is connected. Birth, growth and death…beauty and destruction…it’s all growing in the garden. So here are thirty-one ways gardening gives to you…and the best thing is that size doesn’t matter! You can tend a small jewel-box of a garden or several acres, so find the size and style of garden that suits you best and get started. 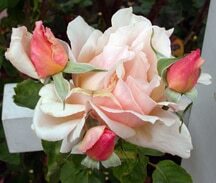 Know that these gifts from the garden aren’t confined to the month of May – they are there twelve months a year. I wish you a Magnificent May and Good Gardening!